Over the past few days I've been working on the Effortless Cardigan. 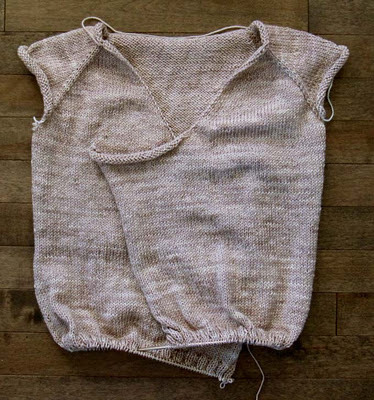 The pattern is well-written and the knitting is, well, effortless! I'm halfway finished, at least I'd better be halfway. I've used half the yarn. If I'm not halfway then I'm in trouble! I like the Tosh DK yarn. My hands are loving the softness. I've read on various blogs and on Ravelry that sometimes there is a wide difference in color between skeins of the same dye lot. However, so far at least, I'm not finding that with this color. Maybe it's because gossamer is a lighter color. Having said that, I hope that the remaining three skeins are as consistent as the first three. I just need to finish 2 more inches of ribbing at the bottom, the two sleeves and the ribbing along the front edges and neck. My Effortless is just at the waist, although I changed my gauge to be a good bit denser than the pattern called for, I'm useing a 4.0 or 4.5mm, so I adjusted my stitch counts dramatically too. I need to take a look and see how many skeins I've used... and how many are left, and decide on final length of sleeves and body... Thank goodness I got extras and I like 3/4 length sleeves!